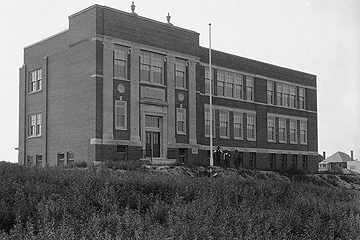 1925 Sept.3: School opened in two portables under principal Miss N.J. Yeo. Named after Sir Adam Beck, first chairman of the Hydro-Electric Power Commission of Ontario. 1926 June 17: Cornerstone laid for permanent schoolhouse. 1927 Dec 16: School officially opened. ADM-PS-a: (WWII): A.J. Casson “For King and Country/Members / of Adam Beck Public School / who have volunteered for active service / with / Canada’s fighting forces.” Four main columns of names inside borders; two short columns of names outside borders (one on the left side; one on the right side). Surnames followed by initial(s) except for women whose given names are in full; two teachers are listed as Mr. (no initial or given names) followed by surname. Key: A gold hand-drawn cross, outlined in black indicates “Died or Killed in Action”; a silver hand-drawn five-point star indicates “Prisoner of War.” List does not specify which war, but date of school opening, presence of women’s names, and the use of an A.J. Casson document, indicate World War II. Lettering by Charles E. Challis. The original school on this site, named Gladstone Avenue School, opened June 1, 1888, and consisted of eight classrooms and two kindergartens. In 1925, a new three-storey building was erected and the name of the school changed to Alexander Muir in honour of the first principal, 1888–1906, and author of the patriotic song “The Maple Leaf.” (Forever). A senior school addition was erected in 1952, the cornerstone was laid on May 9, and the building was officially opened on April 7, 1954. Building operations for the latest senior school wing commenced November 1959, and the building was formally opened on June 7, 1961. The site was enlarged by the closing of Trafalgar Street. ALX-PS-a (WWI): Framed under class: “Alexander Muir School Honor Roll”. Four columns with “Staff” written above the first and fourth columns. Two staff members are listed under each heading. Surnames followed by given names. (Bottom of document: BOND-Toronto). Located beside library door. 1926: small wooden one-room school built for 22 pupils from grades 1 to 8. Probably classes were taught in portables on this site beginning in November. By December, Lord Allenby, a British First World War hero, gave the Board permission to name the school after him. 1927 Jan: There were two wooden structures; total of 69 pupils. 1927 Nov 8: Cornerstone laid. 1928 Jan: Nine-room building opened with 311 pupils and eight teachers. 1929: Toronto continued to expand north; ten-room addition started. 1931 Mar 17: Official opening. Lord Allenby invited, but unable to attend; sent best wishes by telegram. A few months later, he granted the school permission to use his crest and his motto “Fide et Labore” (by Faith and Hard Work). 1933: Two additions; one at the south end included three classrooms and a swimming pool; one at north end had four classrooms and a general purpose room. 1946 Mar 5: In a letter displayed near the war memorial, the Toronto branch of the Junior Red Cross thanked Allenby students for their donation to the war effort, helping children of Europe and England. (The Kinsmen-sponsored “Milk for Britain” fund.) Allenby’s donation of $122.21 was the largest received from participating Toronto schools. Room 20 gave ten dollars. Published history: Ritchie, Don. North Toronto. Boston Mills Press: Erin, ON., 1992. pp 130-133. ALL-PS-a: (WWII): (illuminated list). [Union Jack, school crest, Ontario Ensign] Honour Roll / Allenby Public School / Former Students who served in the Armed Forces During World War II (1939 – 1945). Five columns. Surnames followed by given names and initials. Key: A red asterisk indicates “Missing, killed or died on Active Service”. These names are grouped in column iii. Opened: 1886 Completed in June; opened in the fall. History: The oldest public school in the West Toronto area. Decision to purchase school site made by trustees of School Section 22, York Township, in November 1885. A two-room red brick building was erected in 1886. In 1888, West Toronto Junction became an incorporated village; one year later, an incorporated town. In 1889, the school had six rooms; gradually enlarged to 12 rooms. In 1890, Annette became the County of York Model School, and so continued until the town withdrew from the jurisdiction of the county council. West Toronto became a city in 1908; one year later it was amalgamated with the City of Toronto. Soon after amalgamation, the old school was demolished. In 1911, the first unit of a new building was erected. The top two floors were added in 1912. The senior school wing was erected in 1960, when the existing building was renovated; formally opened on March 1, 1962. Published history: Miles, Joan and Diana Fancher (editors). West Toronto Junction Revisited (writings of A.B. Rice), 4th edition. Toronto: West Toronto Historical Society, 1999. 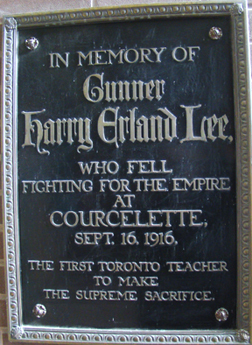 ANN-PS-a-RIP: (WWI) Bronze memorial (with black background) to Gunner Harry Erland Lee, 16 Sept 1916, the first Toronto teacher to die in World War I.
ANN-PS-b: (WWII) A.J. Casson “For King and Country Members of Annette Street School who have volunteered for active service with Canada’s fighting forces.” There are six columns of names. List does not specify which war, but an A.J. Casson document and the presence of women’s names usually indicates World War II. ANN-PS-b-RIP: (WWII) Centred, at the top of columns iii and iv, above two stylized olive branches, is an “In Memoriam” section, with 10 names on each of two lists. 1959: Four more classrooms and gymnasium added. BAL-PS-a: (WWII): Illuminated list; “Honour Roll” headed by five coloured flags; hand-printed; designer unknown; some water damage and aging. Four columns, with five names arranged at the top. Surnames followed by given names or initials. Key: cross “Killed in action.” List does not specify which war, but presence of women’s names and mention of women’s divisions, indicate World War II. NOTE: The list does not name the school, but was on site in June 2008. 1906: Built by East Toronto Public School Board. 1907 Sept: School opened as a four-room, two-storey, brick schoolhouse, known as Pine Avenue School. Only the first five grades were enrolled at Balmy Beach School. Enrolment of 256 pupils. The first principal was N. Jennie Yeo. The original teachers were, Elizabeth Lucas, Annie E. Walker and Minnie M. White. .
1908 Oct 6: The name Balmy Beach school was first used at a school board meeting. 1908: Town of East Toronto annexed to the city of Toronto. The area changed from a resort to a residential community. Increasing enrolment resulted in additions in 1910, 1911, 1914, 1921, 1928, and 1929, making a total of 21 rooms and 827 students. BLM-PS-b: (WWII) (illuminated list designed by A.J. Casson). “For King and Country/ Members of/ Balmy Beach Public School/ who have volunteered for active service/ with Canada’s fighting forces.” Six columns. Surnames followed by given names or initials. Key: A red hand-drawn cross indicates “Killed”; a red hand-drawn asterisk indicates “Missing.” List does not specify which war, but presence of World War I memorial, women’s names, and the use of an A.J. Casson document, indicate World War II. 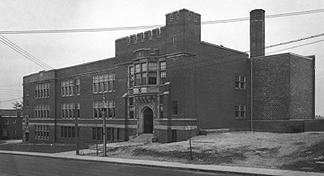 1910 Apr 26: Purchase of site approved by North Toronto Public School Board. 1910 Nov. 3: Temporary accommodation rented in the Bedford Park Mission. 1911 Sept.: New building occupied; Forsey Page, architect. 1926 Sept.: When John Wanless Public School opened in two portables, the Bedford Park principal supervised the classes. 1927 Mar 1: When Blythwood Public School opened, the Bedford Park principal supervised its one-room portable. BLM-PS-a: (WWII) (illuminated list designed by A.J. Casson). “For King and Country / Members of / Bedford Park School, Toronto, Ont. / who have volunteered for active service / with / Canada’s fighting forces.” Eight columns. Surnames followed by initials. No key. List does not specify which war, but presence of women’s names, and the use of an A.J. Casson document, indicate World War II. NOTE: No World War I list has been found. The school also has a plaque listing of teachers (13 names) “who died while on our staff or after superannuation” (1912-1960). 1907: the first post office (in Arthur Mitchell’s store, Kingston Road and Birchmount) was named Birch Cliff. Many early homeowners were English, Irish, Scottish artisans and wage-earners who commuted daily (about six miles) to Toronto; some by green radial car (five-cent fare). 1916 Sept 5: School opened. Principal and only teacher, Mrs. E.E. Reece, had arrived in Canada the year before. Some students had previously attended Oakridge School. Completion of the 10 to 12 planned rooms was delayed because of WWI. (Architect’s drawing had appeared in July newspaper.) Only 45 senior students were able to attend. “Birch Cliff” (after the birch trees along the bluffs) was the name of an early settler’s home. 1916: Money raised for causes such as Belgian children, Red Cross, Royal Navy Home, and Consumptive Home. 1917 June: The only upper fourth (grade eight) pupil, Alex McCartney, passed his entrance exam to high school with honours. 1917 Sept: Four rooms completed. Further early teachers were Miss Bunner and Miss Wilson. 1918: Ratepayers presented a piano to the school. 1918 Oct: School closed for a time to check spread of influenza. No students or parents died. 1919: First four-room addition (Rooms 5, 6, 11 and 12). Previously the Kalmar Club (later a nursery school at Eastwood and Freeman) was used for classes. 1920 Feb 12: Home and School Association formed. From 1921 until 1944, they established a lending library in the school—adults only; children’s books added in 1925. 1921: Classes staggered to handle pupil-load. 1922: Rooms 1, 2, 7 and 8 added. 1920s (late): Pupils planted and harvested Morley’s Field (west of the school) to provide free lunches for those who stayed at noon. 1928: Enrolment reached 590. Four “temporary” portable classrooms set up in schoolyard; remained until 8-room addition completed 22 years later. 1935: Lorne Wideman (teacher; later principal) started hockey as a school sport. Games on the back rink when boys could find a puck and enough sticks. 1941 June: Mrs. E.E. Reece, principal, moved to Board of Education. W.J. Taylor, former teacher, became new principal. 1951 Mar 15: Eight-classroom addition. 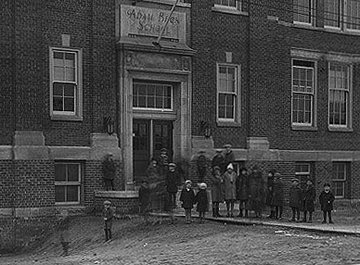 Website: http://schoolweb.tdsb.on.ca/birchcliff/PhotoGallery/BirchCliffsPast.aspx Includes much local history and school history taken from a Journal (recording years 1917- 1966) presented to the school by Henry S. Redman, Township Solicitor, December 31, 1917. The following three-part series on the history of Birch Cliff Public School, written by an unknown author in 1966 for the school’s 50th anniversary. It includes many historical images. BIR-PS-a: (WWII) Illuminated list designed by A.J. Casson. “For King and Country / Members of / Birch Cliff Public School / who have volunteered for active service / with / Canada’s fighting forces.” Six columns. Surnames followed by given names. Key: A black-inked star indicates “Those who gave their lives in the Service of King and Country.” Near the bottom of column iv, names beginning with “a” to “h” start a new list. Column v is headed “Names added after March 1944” and includes “a” to “w” Only one name, John Burman, appears in column vi (high up). There is no explanation for this placement. Also in this column is a General Service badge. No World War I list has been found. List does not specify which war, but presence of women’s names, and the use of an A.J. Casson document, indicate World War II. 1920 Oct 1: Birch Cliff Heights Congregational Church rented for $75 per month. Miss Eva Clark of Fergus, Ontario, hired as teacher. Salary: $800 per annum. 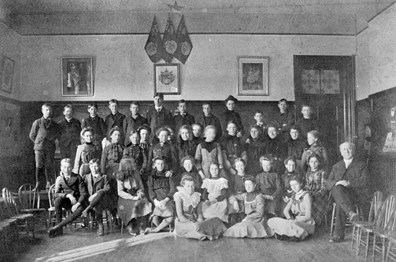 1920 Nov: School opened; 50 students enrolled during the year. 1921 Summer: The rented church had proved too small. The trustees spent $400 to repair the Ratepayers’ Hall for use as a classroom. Miss Emily Burgess, of England, engaged as a teacher. Salary: $1,000 per annum. (A school history lists her as: Principal 1921–1926.) E.C. Beesly hired as caretaker for $10. per month. 1922 June 30: Cornerstone was laid by Toronto Mayor Maguire, assisted by “the Reeve and Council of Scarboro.” Coins and newspapers of the day were placed inside. Architects: Burden & Gouinlock (noted for their use of “collegiate Gothic” style in southern Ontario schools). Contractors for the brick and hollow-tile school were Carswell Construction Co. The trustees had purchased a five-acre site—the northwest corner of a farm—for $24,000. The (122′ 1″ x 35″ 4″) school to have four classrooms; four offices, a main stairway, and hall, with an eventual total of 16 classrooms and an auditorium. 1922 July 1: A “Dominion Day, 1922” program lists many events, including “Married Ladies’ Race—2 prizes, 50 yds. ; Fat Mens’ Race—2 prizes, 100 yds. ; Smoking Race—2 prizes, 50 yds. ; Men’s Tug-of-War—Birch Cliff vs. Scarboro Bluffs; Kennedy Heights vs. Scarboro Junction. A football match featured Birch Cliff United vs. Amputation Club. A baby show (4 silver cups) children’s fancy dress parade, fire fighting demonstration and much more added to the “Prizes for All” celebrations. Slide shows by local organizations and an 8 p.m. community dance rounded out the day. 1972 Mar 1: Toronto Star article described the opening of a time capsule under the school’s cornerstone, sealed in 1922 when the school opened. 1972 Spring: Celebration of 50th Anniversary included a musical revue, displays, a slideshow of 300 photos, and plans to place a new time capsule in the cornerstone. (The face of the cornerstone had been “redressed” by Bob Cable, son of one of the early trustees.) A 50th anniversary commemorative medal was distributed—free to the original 1922 students and to current students—25 cents to others. Birch Cliff Heights Public School: 50th anniversary, 1922-1972. [Scarborough, ON: The School, 1972?] 10 pp. Bonis, Robert R. A History of Scarborough. Scarborough, ON: Scarborough Public Library, 1968. 387 pp. : ill.
BCH-PS-a: (WWII): Illuminated list designed by A.J. Casson. 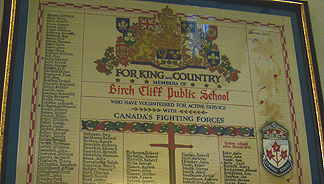 “For King and Country / Members of / Birch Cliff Heights School / who have volunteered for active service / with / Canada’s fighting forces” Four columns. Surnames followed by given names. No key, but silver stick-on star seems to indicate death. List does not specify which war, but date of school opening, presence of women’s names, and the use of an A.J. Casson document, indicate World War II. 1993: Original building replaced. Archway preserved on school grounds. BLN-PS-a: (WWII & Korea) (illuminated list designed by A.J. Casson, noted as “AJC”). “For King and Country / Members of / Blantyre Ave. Public School / who have volunteered for active service / with Canada’s fighting forces.” Four columns. Surnames followed by given names. No key, but a silver stick-on star probably indicates death. One name (Robert Millar) has a hand-drawn star with “Korea” beside it. List does not specify which war, but date of school opening, presence of women’s names, and the use of an A.J. Casson document, indicate World War II. 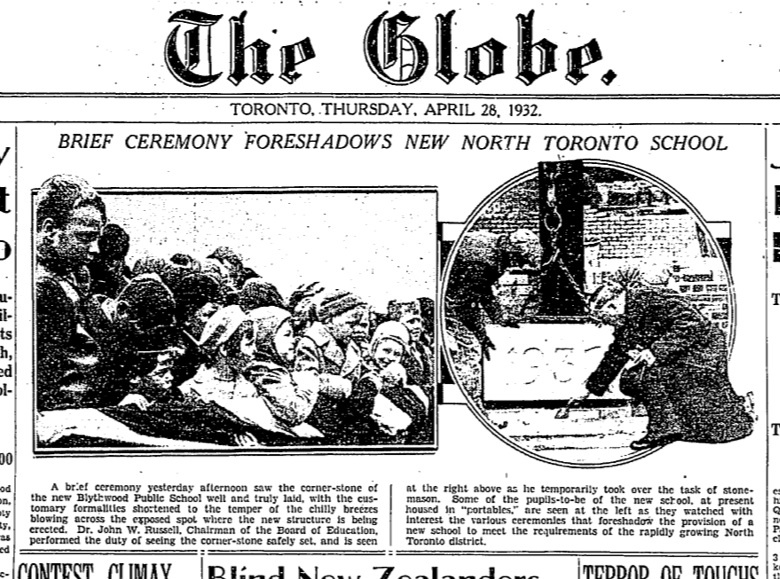 Setting of the cornerstone for the new Blythwood School noted in The Globe, on April 28, 1932. 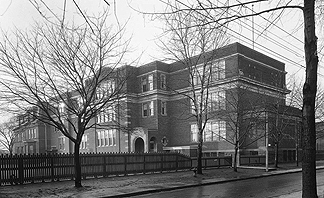 History: Opened as a one-room portable on the present site under the principal of Bedford Park P.S. on March 1, 1927. Corner stone laid April 27, 1932; new building occupied Oct. 3, 1932. Formal opening Oct. 28, 1932. Ritchie, Don. North Toronto. Boston Mills Press: Erin, ON., 1992. pp 130-133. BLY-PS-a (WWII) A.J.Casson “For King and Country: Members of Blythwood School who have volunteered for active service with Canada’s fighting forces.” Four columns of names; surnames followed by given names. Red cross symbol is footnoted “Died on Active Service”. 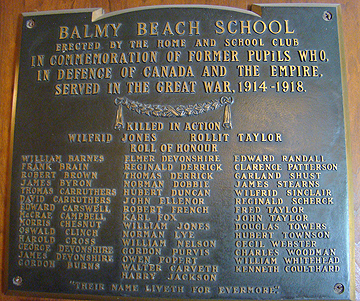 List does not specify which war, but the school was built after World War I.
BLY-PS-b (WWII) Vertical wooden frame of six photos with names printed underneath; no explanation, but photos match BLY-PS-a names (except for George Brockway), that have a red cross symbol indicating ”Died on Active Service”. BLY-PS-c (WWII) Vertical wooden frame of six photos with names printed underneath; no explanation, but photos match BLY-PS-a names that have a red cross symbol indicating ”Died on Active Service”. 1922: Oct 24: Cornerstone laid. 1964: Joined to Fairmount Park Public School. BOW-PS-a: (WWII) A.J. Casson “For King and Country / Members of (sic) Teachers and Pupils of Bowmore Road Public Street School who have volunteered for active service with Canada’s fighting forces.” Four columns of names. Silver stick-on star indicates “Killed.” Although the key shows “Missing”and “Prisoner of War” designations, no symbols for these were visible on either list. Surnames followed by given names or initials. A – L (part). List does not specify which war, but date of school opening, presence of women’s names, and the use of an A.J. Casson document, indicate World War II. BOW-PS-b: (WWII) A.J. Casson “For King and Country / Members of (sic) Teachers and Pupils of Bowmore Road Public Street School who have volunteered for active service with Canada’s fighting forces.” Four columns of names. Silver stick-on star indicates “Killed.” Although the key shows “Missing” and “Prisoner of War” designations, no symbols for these were visible on either list. Surnames followed by given names or initials. L (part)–Wright, followed by miscellaneous names. List does not specify which war, but date of school opening, presence of women’s names, and the use of an A.J. Casson document, indicate World War II. BOW-PS-c: (WWII) Circular bronze plaque, coloured military and peace symbols. “Remember their deeds. / They shall not grow old.” No names. 1887: School opened. Margueretta Street runs parallel to nearby Brock Avenue, named for James Brock (d. 1833) a cousin of Sir Isaac Brock. James Brock owned land in the area. In 1850, his widow, Lucy, subdivided the land. A road allowance from the lakeshore to Bloor Street became known as Brockton Road; later changed to Brock Avenue. Presumably the school took its name from the street. This was one of several Toronto schools where Alexander Muir, composer of “The Maple Leaf Forever,” taught. 1996: Rooftop garden built for hands-on ecological learning. 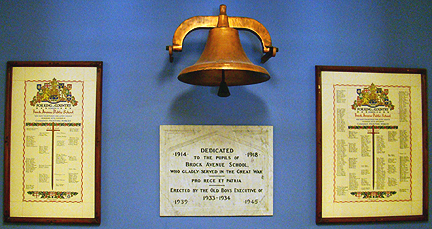 BRO-PS-c: Grey granite plaque (below old school bell with copper-coloured finish) Dedicated / 1914-1918 / to the pupils of / Brock Avenue Public School, / who gladly served in the Great War / pro rege et patria / Erected by the Old Boys executive of / 1933-1934 / (bottom corners) 1939 –1945. 1923 Dec: Opened as Leslie Gardens School with 389 pupils. 1924 Apr 3: School renamed Bruce Public School in honour of Edward Wesley Bruce, inspector of public schools. NOTE: 1867 Oct.: Leslie Gardens inspired Alexander Muir’s patriotic song, “The Maple Leaf For Ever,” as follows: Muir and friend George Leslie (of Toronto Nurseries fame) were walking in Toronto near Leslie’s Gardens (near Queen St, east of the Don River; named after the Leslie family of Leslieville, a former suburb of Toronto). A falling maple leaf lodged on Leslie’s coat sleeve, despite efforts to brush it off. “There Muir! There’s your text! The maple leaf is the emblem of Canada! Build your poem on that,” Leslie is said to have exclaimed. Muir wrote the poem and sent it to Montreal a few hours later, as a last-minute entry in the Caledonian Society of Montreal’s patriotic poetry contest. It won second prize. The name Leslie Garden still exists as Leslie Garden Lane, Toronto. BRU-PS-b: (WWII): Illuminated list designed by A.J. Casson. 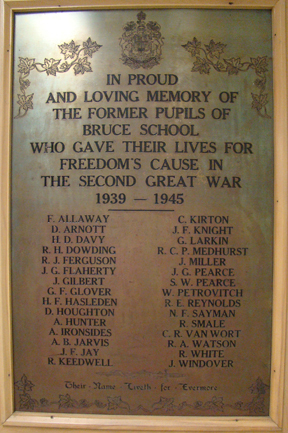 “For King and Country / Members of / Bruce Public School / who have volunteered for active service / with / Canada’s fighting forces.” Four main columns of names inside borders (all four columns continue below the key and the bottom border line); two short columns of names outside borders (one on the left side; one on the right side). Surnames followed by initial(s) except for women, whose given names are in full. Key: A red cross indicates “Killed or Died in Service”; a red circle indicates “Missing”; a red star indicates “Wounded”; red P.W. indicates “Prisoner of War.” List does not specify which war, but date of school opening, presence of women’s names, and the use of an A.J. Casson document, indicate World War II. 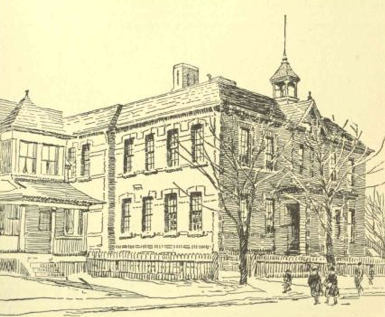 1889: A two-storey, eight-room brick school built by West Toronto Junction Public School Board. Carleton Village (named after Sir Guy Carleton) amalgamated with the Town of West Toronto. 1909: The Village of Carlton was incorporated into the City of Toronto. The Toronto School Board gained jurisdiction over the school at the corner or Connoly and Osler Streets. 1914: Three-storey, 17-room, Carleton Public School was built on the northwest corner of Davenport Road and Osler Street, on an elevated site overlooking the intersection. It replaced an earlier building. It is an example of an early 20th century educational building with features of Edwardian Classicism. 1919: Swimming pool was added. 1924 June: 313 pupils transferred from Davenport (Carlton) School to General Mercer Public School. 1945: The Toronto Board renamed the school “Davenport Road School” because of a request from Old Davenport Road United Church. 1989: Following a merger with Osler Public School, the building at 2054 Davenport Road became known as the South Building of Carleton Village Public School. It may be turned into a police station. Students now (2008) attend the north building, 315 Osler Street. Published history: Ward 7 Schools, by W. Harold Male, 1947. p.17. 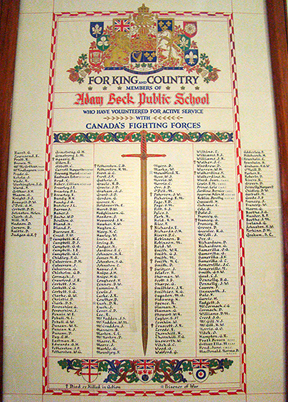 CAR-PS-a: (WWI) “For King and Country / Carlton School / Roll of Honour Canada.” Framed illuminated list; Three columns. Given names followed by surnames. Regular handwriting in ink. One handwritten star indicates “Wounded.” Two handwritten stars indicate “Died of Wounds or Killed in Action.” List does not specify which war, but the deaths match the names on CAR-PS-b, which specifies WWI. CAR-PS-b: (WWI) Bronze plaque: “For God, For Truth, / For Liberty. / In Memory of / Former Pupils of Carlton School / Who Gave Their Lives in The Great War / 1914 – 1918.” Two columns. Given names followed by surnames. CAR-PS-c: (WWII) Bronze plaque: “1939 Second Great War 1945 / The Torch You Threw to Us We Caught.” Two columns. Given names followed by surnames. CAR-PS-d: (WWII) A.J. 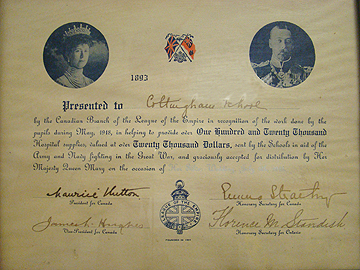 Casson “For King and Country / Members of Carlton Public School who have volunteered for active service with Canada’s fighting forces.” Gold cross appears to indicate death. Eight columns. Surnames followed by given names. A new alphabetical list begins in column seven. Thirty-two names appear below the border. There is no explanation for the placement of these two extra lists; presumably these names were added later. List does not specify which war, but presence of women’s names, and the use of an A.J. Casson document, indicate World War II. Also, the deaths match the names on CAR-PS-c, which specifies WWII. Clinton Street, north of College Street, was the official location of the first Clinton Public School, built in 1887; opened in 1888 with 480 pupils as a two-storey, eight room brick building. In 1898, four rooms were added in a third storey. In 1913, a new three-storey, 17-room school was built on Manning Avenue, but the “old” school was retained. From 1913 to 1915, the old building housed the high school of commerce and finance, then again served public school students. In 1923, six more rooms were added to the 1913 building. In 1964, a completely new Clinton Public School (Junior) was proposed; cornerstone laid October 22, 1965; formal opening November 21, 1966. Published history: Clinton Public School, 1888-1988. Toronto Board of Education, 1989. When the Village of East Toronto was incorporated in 1888, there were about 800 people—many of British origin—living in the rapidly-growing area. In 1903, the village became a town. George Coleman had built the Eastbourne House Hotel at the southeast corner of Danforth and Dawes Road. The surrounding hamlet was called Coleman’s Corners. Presumably Coleman Avenue and eventually Coleman Avenue School took their names from this piece of local history. 1908: East Toronto annexed to the City of Toronto. Ownership of Coleman Avenue School passed from the local Board to the Toronto Board of Education. 1911 Feb 15: The $40,000 set aside for a new building for Coleman Avenue School put on hold when costs pared by the Finance Committee. 1912 Oct: Contract awarded to Pease Heating Company for a new furnace. Cost: $165. 1915 June 29: D.M. Davidson recommended as principal. York Township school trustees given notice to vacate a room in Coleman Avenue School to make room for local children. 1918: When trustees made their annual spring trip around the schools, Coleman Avenue was seen as “generally in bad condition,” with all four rooms full. Trustee Hodgson stated that the school must be improved, as it would likely be needed for five or ten years. 1923: Seventy pupils housed in a double portable. 1926: Some houses on Coleman Avenue and Balfour Avenue demolished near the school site. 1927: Neighbouring Gledhill School added three rooms to help relieve overcrowding at Coleman Avenue. Plans for an additional two rooms and remodelling at Coleman. A.M. Ross, principal of Norway School, moved to Coleman Avenue School. Coleman’s WWII memorial is now at the TDSB archives. 1967: East End High School, an all-boys school, opened on the old Coleman Avenue School site. Nicknamed “Portable City” because of its many outbuildings, it was re-named Lakeview Secondary School, became a co-ed school, and moved to a new site in 1970. 1973: A new special needs school, William J. McCordic, opened nearby. The old Coleman Avenue building was demolished shortly before McCordic opened. COL-PS-a: (WWII): Illuminated list designed by A.J. Casson. “For King and Country / Members of / Coleman Avenue School / who have volunteered for active service / with / Canada’s fighting forces.” Four columns. Surnames followed by given names. Names are grouped under headings of branch of service: Navy; Merchant Navy; W.R.C.N. ; Army (R.C.A.S.C. ); C.W.A.C. ; and R.C.A.F. Key: a silver stick-on star indicates “Lost in action.” List does not specify which war, but the presence of women’s names (in World War II divisions) and the use of an A.J. Casson document, indicate World War II. NOTE: This memorial is now in the archives of the Toronto District School Board. No WWI memorial has been located. 1877: Two-room school built by the Yorkville P.S. Board adjacent to the present site. 1878: School opened. First principal, Miss B. Gillin, who served to 1891. 1883: Town of Yorkville annexed to the City of Toronto. 1905: Two rooms and kindergarten added. Cottingham School, 1878-1950. 1950, 12p. Hutcheson, Stephanie. Yorkville in Pictures 1853 to 1883: the early history of Yorkville. Toronto: Toronto Public Library Board, 1978. COT-PS-b: (WWII) A.J. Casson “For King and Country Members of Cottingham Street School who have volunteered for active service with Canada’s fighting forces.” Six columns of names. Red cross indicates “Killed in Action”. Surnames followed by given names. List does not specify which war, but the use of an A.J. Casson document, presence of women’s names, indicates World War II. A copy of a war art painting surrounded by Courcelette special memories at the school entrance. At Courcelette’s main entrance, The Capture of the Sugar Factory (mural) is the centre of the school’s memorials. Courcelette is a village in the Picardy region of northern France. The Great War battles that took place there were part of the Somme offensive against the German army. Canadian forces took part in the battle of Courcelette from September 3 to November 18, 1916. No students from Courcelette Public School fought or died during the battle, but the school was renamed Courcelette to honour six young men from this Scarborough neighbourhood who died in the battle. In 2001, nine veterans attended the annual Remembrance Day service. In 2004, the renovated school playground was dedicated to vets: Alex Napier, Bill Hussey, Laurie Rhydwen, and Harry Stone, all by then in their eighties. At least three of the vets tried out the new slide. Alex Napier, considered the school’s “grandfather” lived to be 98. Before 1900, visitors went to the “Beach” area by paddle boat steamer from downtown Toronto. They travelled east from the foot of Yonge Street, and disembarked at a wharf at the bottom of Victoria Street. In 1900, Courcelette Road (at the time called Chester Avenue) had only three cottages and one house. What became the school property was an open field with wild flowers, and an abundant crop of wild strawberries. 1910: The sum of $16,000.00 allotted for the purchase of land and construction of a school. 1911: A two-room, red brick school opened as Chester Avenue School. Miss Mary Pepper, the first teacher, taught 49 students in one room; all grades. As there was no other school in the area, students who later went to Birchcliff Public or Blantyre had to walk from as far away as five or six kilometres (three to four miles). When the school outgrew its one room, a second room was added and the basement used. In a 1949 interview about her eight years at Courcelette (1911-1920) Miss Pepper recalled: The school had outdoor toilets and no running water. Heat was from a wood stove, which had to be stoked on cold mornings. Drinking water came from a tin cup and bucket at the back of the room. The playground had separate areas for boys and girls, divided by a picket fence. Gas lights were used until electricity became available. Although a furnace was added, it was unreliable. Some days Miss Pepper took the class down around the furnace to warm them up. Water froze in the pails. The children were sent home when the cold was too much to bear. 1937: Courcelette Home and School Club hosted its first annual garden party. 1941: Home and School hosted a Valentine dance and bridge at Balmy Beach Canoe Club to organize materials for armed forces overseas. The group had already knitted 300 items and sent 65 boxes and 25 cartons of clothing to Europe. 1942: The Home and School Association’s war services group displayed materials to be sent to forces stationed overseas. 1958: Official reopening. Old school torn down. 1959: School dropped the “Road” in its name to become “Courcelette Public School.” To remember those who had served in the wars, honour rolls and a memorial painting were unveiled. 1961: Golden (50th) anniversary. Poem “Dear Old Courcelette (four stanzas) written by Elaine Riley. 1980: School hosted first Fall Fest—its largest fund raiser. 1982: The school revived a tug-of-war competition with Blantyre Public School after a commemorative cup from the 1930s was discovered. 1986: Party at Balmy Beach Club for 75th anniversary. Annual enrolment was below capacity. Good neighbour Malvern Collegiate sends their marching band for the 100th anniversary. 1995: Courcelette war veterans began program of visiting school to read with primary students. 1996: Computer lab set up. 2002: Revitalization of schoolyard over five years began. It included outdoor classrooms with gardens, new play structure, running track, and outdoor mural painted by students. 2008: First portable arrived to handle increasing enrolment. 2010: Thirtieth annual Fall Fest. 2011: Start of automated telephone messages to inform the community of school meetings. 2012 May 26: 100th anniversary celebration. Courcelette Public School: The First Seventy-five Years 1911-1986. Edited by Ray F. Corley (student 1930-1937) and Tim Clarke (principal 1981-1986). Toronto: Courcelette Public School. 18pp. Ill. Includes much early neighbourhood history; teachers past and present; Home and School Association presidents. [Below the mural]: In memory of the men of this district who gave their lives at / Courcelette in World War I, 1914-1918 and to the pupils of this / school who served in World War 11, 1939-1945, this tablet is dedicated. 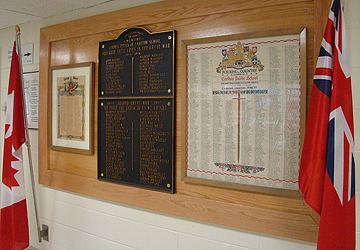 [Bottom of the frame]: Brass plaque: Memorial to the Fallen / Presented by the Courcelette Road School / World War II Veterans Association / Research by Ray Corley / Design by Valear Frizelle / November 11, 1998. COU-PS-c: (WWI): Booklet “They shall not grow old” compiled by Raymond F. Corley, Jan. 1, 1999. Mr. Corley did additional research on the six district men who died in the Great War. For example, he added information from church memorials, school records, etc. Six names. Surnames followed by given names; rank; battalion number in the C.E.F. ; date of death and age. No key. COU-PS-d: (WWII): Posted list: World War II (1939 – 1945) / Former Pupils of Courcelette Road School who graduated in the years 1927 – 1933. Eight names (Clode—Thornton). Surnames followed by given names; rank; branch of service; date of death and age. No key. COU-PS-e: (WWII): Booklet “They shall not grow old” compiled by Raymond F. Corley, Jan. 1, 1999. Mr. Corley did additional research on the eight men who died in World War II. For example, he added information from church memorials, school records, etc. Eight names (Clode—Thornton). Surnames followed by given names; rank; branch of service; date of death and age. No key. Editor’s note on information that appears with the names indexed for our database: B & G School probably stands for Bombing and Gunnery School; S.F.T.S. probably stands for Service Flying Training School. 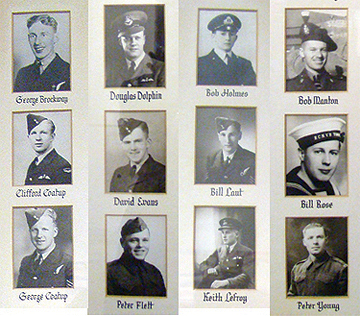 COU-PS-f: (WWII): individual black and white photographs “Lest We Forget 1939-1945.” Eight names (Clode—Thornton). Name, rank, and age appear below each photo. COU-PS-g: (WWII): Illuminated, decorated (maple leaves; Ontario coat of arms) list by Fred Braithwaite, 1959: 1939 Honour Roll 1945 / A Tribute to the pupils of this / school who served in World War II. Two columns. Surnames followed by initials (Andrews, D.S. to Jones, R.G.). Key: red star indicates killed on active service. COU-PS-h: (WWII): Illuminated, decorated (maple leaves; Ontario coat of arms) list by Fred Braithwaite, 1959: 1939 Honour Roll 1945 / A Tribute to the pupils of this / school who served in World War II. Two columns. Surnames followed by initials (Knotts, D. to Young, A. and Corley, R.F.). Key: red star indicates killed on active service.